Once you’ve applied to university it’s a good idea to get your finances sorted, so you can concentrate on getting ready for your studies. Depending on what type of student you are, there are different options available for paying your tuition fees and living costs. Find out if you’re classified as a Home, EU or International (overseas) student on the GOV.UK website. For example, some EU nationals may be classified as Home students and qualify for the same level of financial support as Home students. At LSBU, we’ve set our tuition fee for Home and EU undergraduates starting on full-time courses at £9,250. If this is your first degree you can apply for a student loan to cover tuition fee costs from Student Finance England. You can only apply for a loan for a second undergraduate full-time degree if it’s in nursing, midwifery or allied healthcare. For more information visit the The Funding Clinic website. Our fees for part-time students are provided on each course page. If this is your first degree you can apply for a loan if you complete at least 25% of the full-time course load in each year. Find out more on the GOV.UK website. Apply to Student Finance England (SFE) for your loan and they will pay us direct. SFE will send you a Financial Notification setting out your entitlements - you'll need to bring this document with you to your face-to-face enrolment at the University. Any amount of tuition fee you do not borrow from SFE must be paid at your face-to-face enrolment session when you start at university. If you don’t need a loan for your tuition fees you must pay the University direct. Home students may also be entitled to help with covering their living costs. Apply for a maintenance loan from Student Finance England and it could help you pay for accommodation, travel, food, books and entertainment. EU students should check the GOV.UK website to see if they're eligible as well. Tuition fee and maintenance loans for eligible EU students are unaffected by Brexit for courses beginning in 2019/20. You can apply for a maintenance loan as a distance learning student if you can't attend your course in person because of a disability. You don't repay the loan until you leave University and are earning over a certain amount. You'll repay your loan automatically through your employer via the tax system. If you’re self-employed, you repay the student loan just like you repay tax - through HMRC’s Self-Assessment scheme. Once you start repaying your loan it’s at a rate of 9% of what you earn over £25,000 (if employed in the UK). So if you earn £27,000 a year gross before tax, you’d only pay 9% on £2,000. That’s £180 a year. If your income falls below £25,000, your repayments automatically stop. After 30 years, any remaining debt is written off. Your loan won’t go on your credit file and it won’t affect your ability to get a mortgage or another loan. For more details on repayments visit the Student Loans Company. For more information on our tuition fees read our tuition fee regulations (PDF File 146 KB). You can also download LSBU's fees and financial support leaflet (PDF File 861 KB). Prefer to chat to someone? 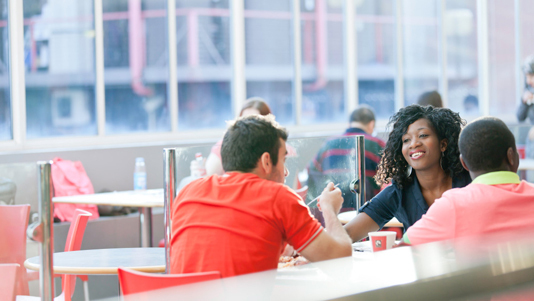 If you’ve applied to LSBU you can speak to our helpful team at the Student Life Centre. If you have other circumstances that mean you need extra support to pay for your studies, such as a disability or you care for a child or adult, visit GOV.UK for information or our student services financial advice page. International (overseas) students can read detailed information about fees and funding on our International pages. Visit our scholarships and bursaries page for more information on what we offer. If you’re a new full-time Home student from a lower-income family you may be eligible for one of our 100 £1,000 cash Access Bursaries. If your employer is paying for your course, they will need to complete our Tuition Fee Sponsorship Form (PDF File 798 KB). Please print off a hard copy and bring it along to your face-to-face enrolment session. Please note: you will remain personally responsible for payment of fees and charges, even where there is an arrangement for the University to receive payment on your behalf from a sponsor or other third party. Some students have their tuition fees paid via a contract LSBU has with the NHS London Strategic Health Authority (SHA). When you enrol or re-enrol, you need to confirm which Primary Care Trust, NHS Trust, Acute Hospital, Foundation Trust, Mental Health Trust or Ambulance Trust you work for, or will be spending your clinical placement with, as part of the LSBU/NHS London contract. The University will validate the information you provide against the contract. You will remain personally responsible for payment of fees and charges, even if there is an arrangement for the University to receive payment on your behalf from a Strategic Health Authority. If you and your employer are funding your course together, this will need to cover the cost of your tuition fees each year. Your employer will need to complete our Tuition Fee Sponsorship Form (PDF File 798 KB). Please print off a hard copy and bring it along to your enrolment session. You may be eligible for a tuition fee loan for your share of the fee via Student Finance England, who then pay us direct. Any amount of tuition fees you do not borrow is payable at your enrolment session. See our tuition fee regulations (PDF File 146 KB) for further information. Where are my fees being spent? University fees cover a broad range of costs to provide a university education. The £9,250 fee contributes to your academic tuition; academic support services; employability, internships and work placement support; wellbeing services; equipment and learning materials; technical support; IT and digital learning; and investment and maintenance in buildings and facilities. See our 2017/18 Undergraduate Home Fee Breakdown (PDF File 98 KB).